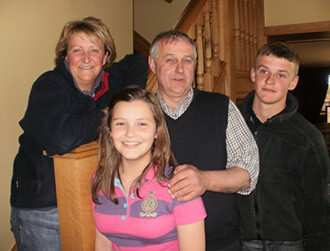 The Wood family of Jimmy and Vikki and their two children Harry aged 16 and Hannah aged 13, who will join them on this year’s congress, live in the North of England near the city of Preston. Older son Thomas will be holding the fort while they are in Australia. Preston is in the "Red Rose" county of Lancashire a sound rival of its nearest neighbour the "White Rose" county of Yorkshire. Both counties are great cattle and sheep breeding areas with outstanding generations of stocksmen who are fiercely proud of their heritage and ability with stock. Both Jimmy and Vikki come from well known farming families in Lancashire and together they run Bowland Foods, which procures quality local cattle for top beef restaurants and retailers all over the UK. 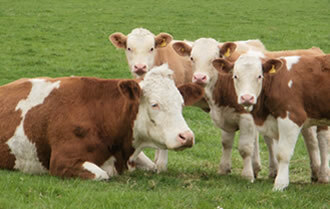 They are very proud of the fact that they have no involvement in the UK supermarket chains, which dominate the UK beef trade in particular. Popes Simmentals was founded in 1988 when Jimmy and Vicki Wood decided to set up a herd of cattle which Vikki would manage. They settled on Simmentals, primarily for their docility and ease of management as Vikki was keen to show the cattle as well as develop a breeding herd. 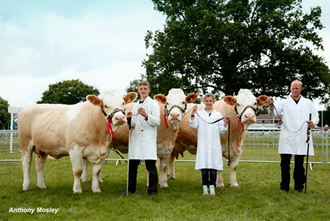 The family all enjoy breeding and showing Simmentals and Harry and Hannah have also become great handlers of Simmental cattle at the national shows and are both outstanding stockjudgers in their own rights.